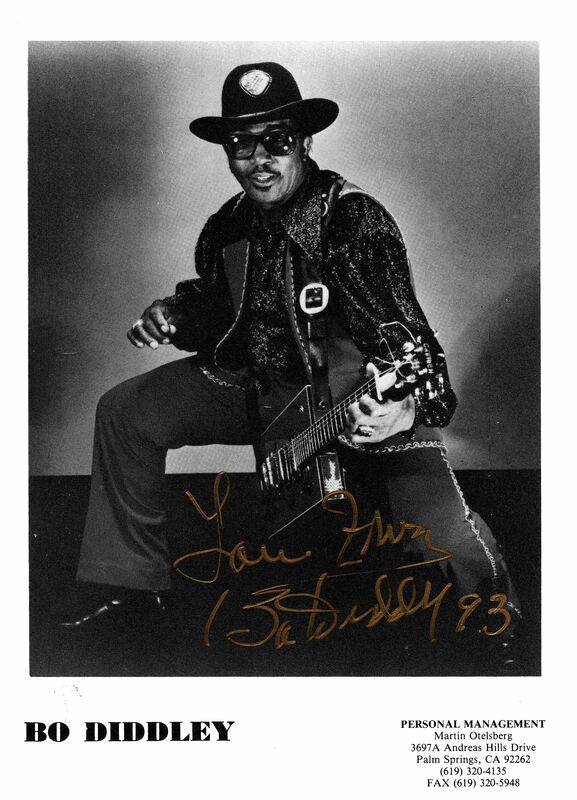 Inducted into the Rock & Roll Hall of Fame and winner of a Lifetime Achievement Award from the Rhythm and Blues Foundation, BO DIDDLEY (1928-2008) was a legendary guitarist, singer, songwriter and musical producer. Born Ellas McDaniel (Ellas Otha Bates) he played a key role in the transition from the Blues to Rock and Roll, influencing many artists including Elvis Presley, the Beatles, Rolling Stones and The Clash. 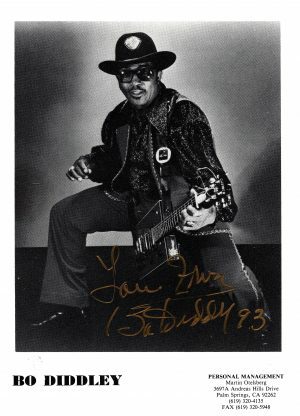 SP: Signed Photograph – 4″x6″ black and white litho print on which, penned in gold marker pen, Diddley has written “Love from Bo Diddley ’93”. Diddley’s use of African rhythms and a signature beat, a simple five-accent hambone rhythm, is a cornerstone of hip hop, rock and pop music. He is also recognized for his technical innovations, including distinctive rectangular guitar. Recipient of a Grammy from the National Academy of Recording Arts & Sciences.